For this winter, this storm may be second only in intensity to the storm from early January in the same region. The most far-reaching effect of the storm will be high winds. Gusts of 50-60 mph will be common from the central and southern Appalachians to the lower Great Lakes and part of northern New England. However, gusts approaching hurricane force are likely along the coast from Delmarva to eastern Massachusetts. The strongest winds are likely to be along the coast of eastern Massachusetts. Extensive power outages are likely spanning Friday to Saturday. Have a working flashlight on hand, and keep cell phones charged. Winds as strong as predicted can knock down trees, cause damage property and make loose objects into projectiles. Walking, standing or driving through areas where there is a canopy of trees may be very dangerous during the storm. Major airline delays and flight cancellations are likely due to the wind alone from Chicago and Detroit to Washington, D.C., Baltimore, Philadelphia, New York City and Boston. Wind-related delays are possible as far south as Charlotte, North Carolina, and Atlanta. Airlines were waiving change fees ahead of the storm, according to the USA Today. Most of the problems from the storm in Washington, D.C., and Baltimore will be due to the wind and not so much from rain and any brief period of snow at the end. Depending on the wind direction, ocean and/or bay waters will be pushed inland, and substantial coastal flooding and beach erosion are anticipated. As the storm moves along and the wind shifts, areas that were not flooded initially may take on water. Tides are likely to run 2-4 feet above normal. Tides may be as much as 5 feet above normal at peak, where the shape of the coast acts as a funnel and prevents water from escaping. The worse conditions are likely in eastern Massachusetts. Offshore waves of 30 feet are forecast. All vessels are encouraged to remain in port. Large vessels should remain at sea until the storm moves away later this weekend. However, areas father south and north may also experience coastal flooding. Lake shore flooding is likely along the southern shorelines of lakes Erie, Ontario and Michigan. Rain will fall in most areas during the first part of the storm. As the storm strengthens, rainfall rates will increase along with the wind. 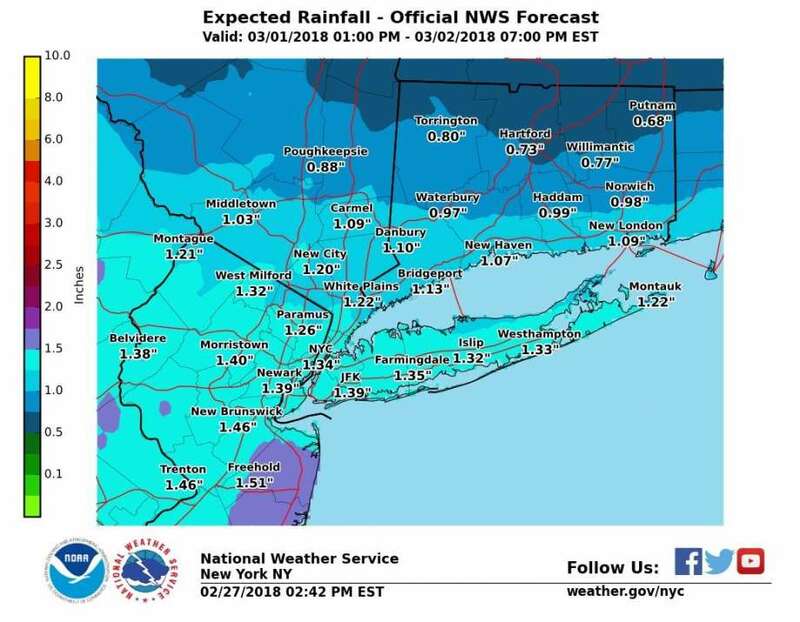 Rain may be so intense that it leads to widespread urban and small stream flooding from part of eastern Pennsylvania and central New Jersey on to the northeastern to eastern Massachusetts. Rainfall in part of this area may range between 3 and 5 inches from the storm, with the heaviest rainfall likely during the day Friday. Significant travel disruptions on area roads are likely from New York City to Boston as a result. Pockets of urban and small stream flooding may occur farther west to the Appalachians. However, a change to heavy wet snow or a sweep of dry air at the height of the storm may mitigate these problems. A change to heavy, wet snow is in store for many areas as the storm progresses. While this changeover process will be complex, it will generally begin over the lower Great Lakes later Thursday and progress to the higher elevations of the Appalachians and then coastal areas from the upper mid-Atlantic to New England Friday. The heaviest snow is forecast over much of western, central and southeastern New York state with the likelihood of at least a few inches of snow around New York City. However, it's possible that much heavier snow falls in New York City to perhaps as far south as Philadelphia. In lieu of high winds, the snow will be heavy and wet enough to weigh down trees and power lines. The weight of the snow, whether it be a few inches to 18 inches will be difficult to shovel and plow. Portions of western and northern Pennsylvania, northern New Jersey and southwestern New England will receive a heavy snowfall as well near the tail end of the storm's precipitation. How quickly cold air is drawn into the storm near the end will determine how far south snow falls in the mid-Atlantic and in southeastern New England. The storm will end from west to east during Friday and Friday night. However, strong winds will continue into Saturday in some communities. Blustery and cold conditions are likely to linger along much of the Atlantic Seaboard into Sunday.